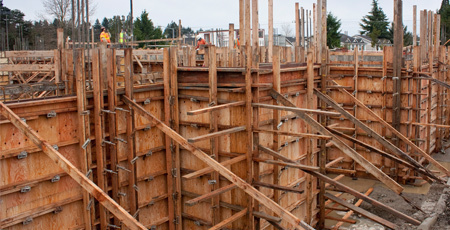 Formwork represents close to half the cost of a concrete structure. That means form development warrants serious and detailed engineering consideration. The realization of architectural intent is also related to formwork quality. The form is to structure what a mold is to sculpture, and it follows that a concrete building or other structure will be as aesthetically true as the form that shapes it. This content is intended for use by architects, engineers and contractors in their pursuit of successful, cost-effective concrete structures. 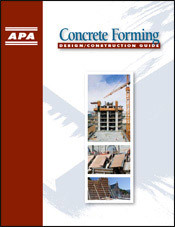 It contains APA panel grade information, form maintenance recommendations, design data and several project case studies, as well as links to manufacturers of APA-certified concrete forming products. Learn more by exploring the links below or source products from the links on the right. 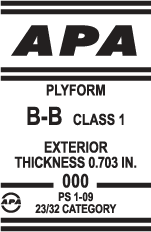 Always insist on engineered wood products bearing the mark of quality – the APA trademark. Your APA engineered wood purchase is not only your highest possible assurance of product quality, but an investment in the many trade services that APA provides on your behalf. The Association’s trademark appears only on products manufactured by member mills and is the manufacturer’s assurance that the product conforms to the standard shown on the trademark. The mark signifies that the manufacturer is committed to a rigorous program of quality verification and testing and that products are manufactured in conformance with an APA or national standard. Panel quality of all APA trademarked products is subject to verification through APA audit. 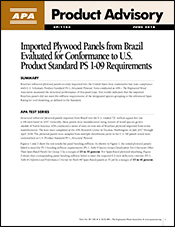 Many imported and off-grade panels never undergo product qualification testing and may not meet the strict criteria necessary for the intended application. Without a credible certification mark showing conformity to a standard, the end-user has no assurance of good panel performance.